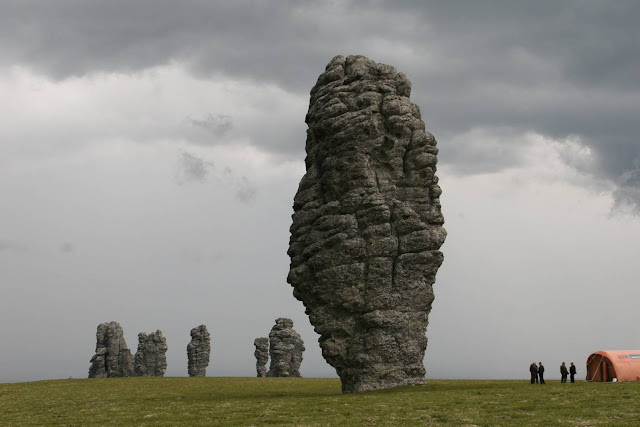 In the Troitsko-Pechorsky District of the Komi Republic there is a flat plateau out of which seemingly burst seven pillars of rock. 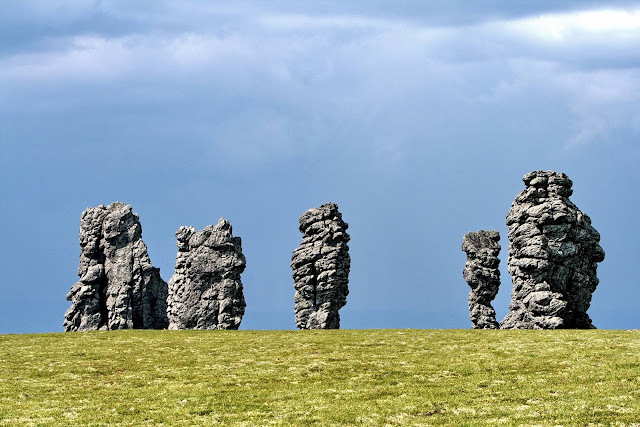 They are known locally as the Seven Strong Men. Without a frame of reference you might think they are remarkable but small, noteworthy but only moderate in size. Yet take a look at the tent and the people in the right hand corner of the photograph and you realise that they are – quite simply – enormous. They range between 30 and 42 meters in height (98 – 137 feet). 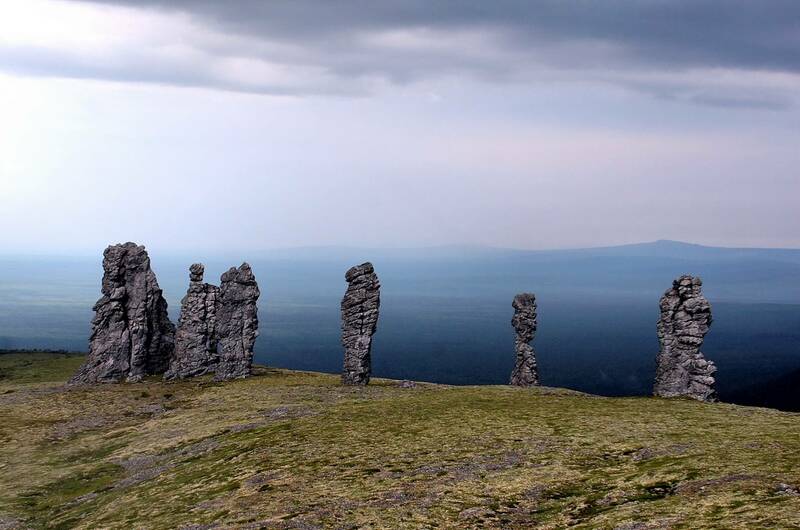 Local legend has it that they are the remains of seven Samoyed giants. 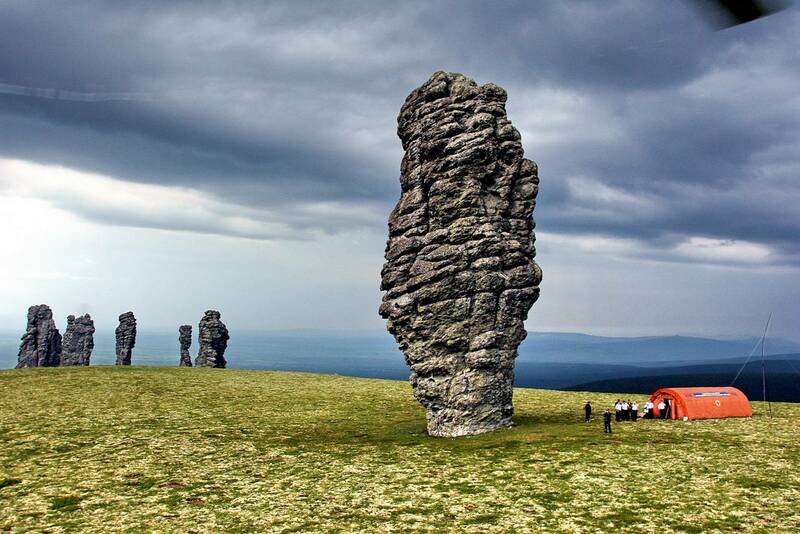 They were on a forced march through the Urals, heading across the mountain ranges to decimate the Vogulsky people. Their Shaman, the largest of the seven, beat a drum to keep his comrades moving relentlessly on towards their quarry. However, he caught sight of the holy Volgulsky Mountains. He let go of his drum and all seven giants froze to the spot. Although the likelihood of this wonderful story being true is, frankly, slim – people then as now love their stories. 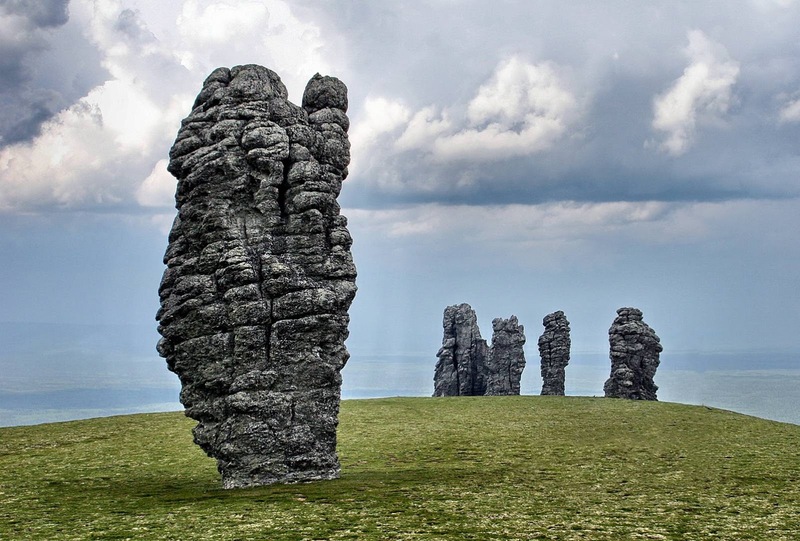 This magnificent ready-made piece of folklore must have inspired a thousand variations on the story over the millennia since people first encountered the Manpupuner Rock Formations. 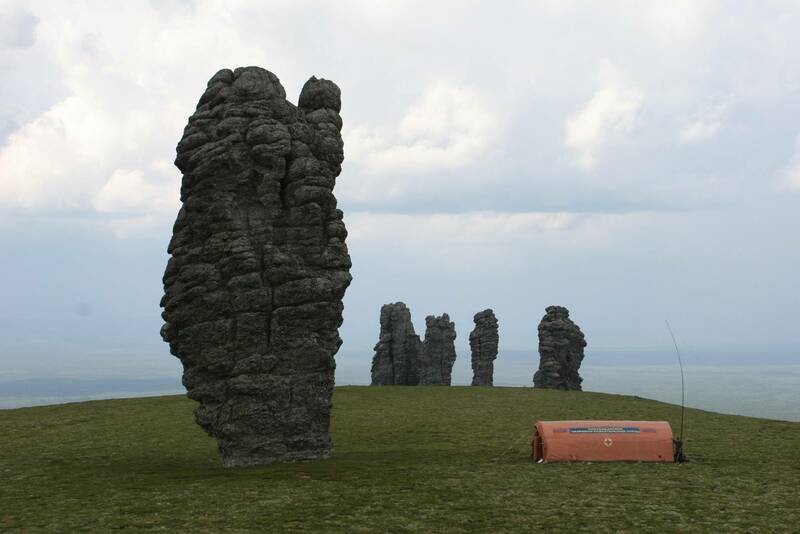 And why not – geologists still haven’t quite worked out what happened to create the formation. Nature the artist – with its collaborators frost, wind and time – has created this immense installation but has left scientists guessing. 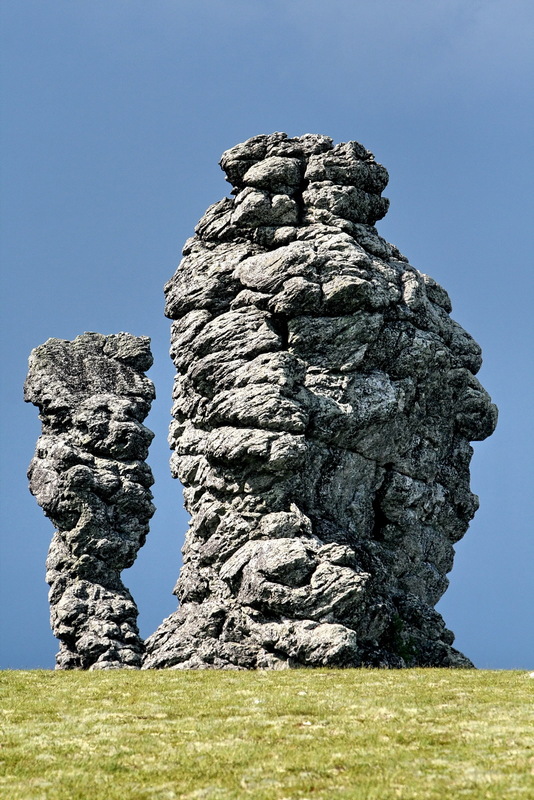 Some think that they are buttes, which are formed by erosion. The Manpupuner are then a harder rock type overlying a more fragile or less hardy rock type. While this is the most likely answer they look to my junior high school geologist’s eyes like volcanic plugs, the landform created when magma hardens within a vent on an active volcano. While scientists struggle with their origins you may be struggling with pronunciation. If you say Man-Pupu-Nyer then you are as likely to be pronouncing it as correctly as any non-Komi. In the Mansi language it means Little Mountain of the Idols. Yet why have so few people outside the Russian Federation heard of Manpupuner? 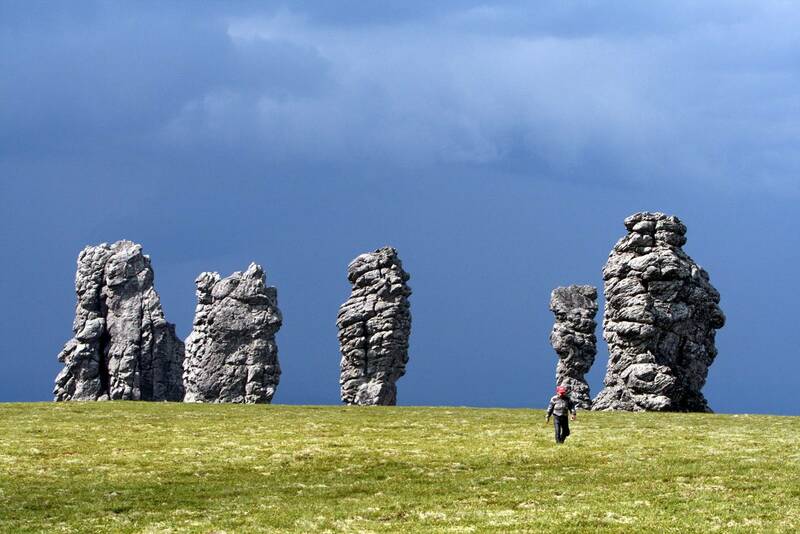 Komi is the thirteenth largest federal subject of Russia but perhaps its geography – Manpupuner is difficult to get to – is what has stopped its fame reaching further. Certainly in 2008 it was designated one of the Seven Wonders of Russia in a competition run by a newspaper and a TV station. Visitor numbers have increased, then, but one small problem quickly arose. 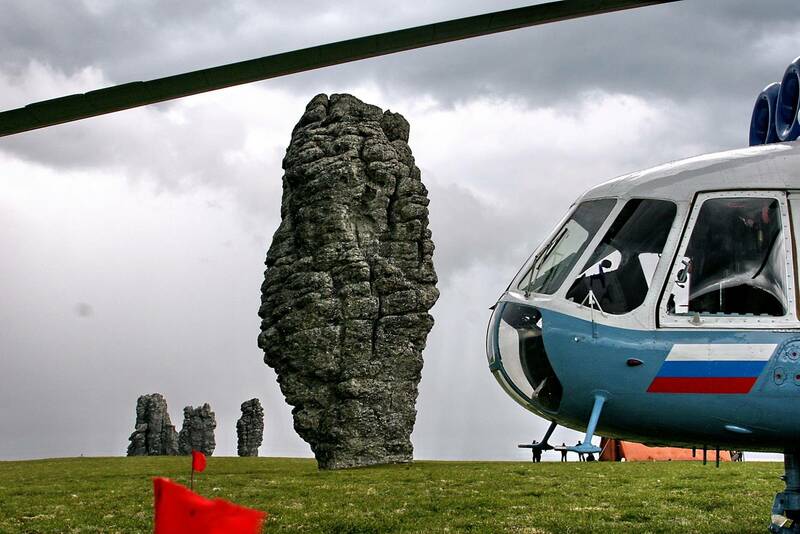 A visiting botanist noted that a unique and fragile form of moss grows at the site: the growing numbers of visitors were threatening its future. Fortunately, wooden planks have now been inlaid and visitors told they must only walk upon them while they visit the Seven Strong Men. Kuriositas would like to thank the Republic of Komo Official Portal for their very kind permission to share these amazing photographs with you. Please visit the portal to learn more about this beautiful and friendly Republic which is also home to the largest virgin forest in Europe.